Belize is a great destination for anglers traveling during the summer months due to its neo to sub-tropical climate, whose daytime temperatures only vary between 10 – 15 degrees over the course of a year. This consistency makes the fishing in Belize fairly predictable, as well as productive, each month of the year. The following write up by Doug Schink (doug@angleradventues.com) on Tarpon Caye Lodge recently appeared in The Angling Report. Tarpon Caye is a 10-acre private island situated 15 miles east of Placencia, Belize in the area referred to as “Permit Alley”. The Caye takes its name from its tarpon lagoon that reliably holds a resident population of mid size (30 – 60 lbs.) tarpon. There are also some fair to good bonefish flats in the area, but permit is the main attraction at Tarpon Caye. 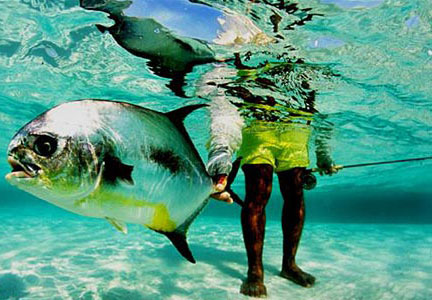 On the top half of the tide, permit predictably flood the dozens of flats found within a 5 – 20 minute run of the Caye. These are skinny, gin-clear ocean water flats and dorsal as well as caudal fins are frequently out of the water. While you can skiff fish, it’s often more productive to wade these firm, shallow flats. It’s not unusual to have 20 or more legitimate shots over a tide. Tarpon Caye Lodge is owned by “Permit Guru”, Charlie Leslie who has spent over 35 years guiding permit anglers on these flats. What distinguishes the fishing program from more conventional “8 to 4” lodge programs is that they will fish the tides. ‘We do fishing here’, is Charlie’s motto, and he means it. If you are there over a full or new moon, your highest tides occur during the middle of the day and thus the best permit fishing will be during the midday hours. However if your stay coincides with a quarter moon when low tide typically occurs around midday, Charlie will schedule “split day” fishing. For example, during these tides, you might fish from first light until the permit leave the flats with the falling tide, say from 5:30 to 8:30 am. You’ll then return to the lodge for a breakfast/brunch, and a siesta. Around 2:00 pm, you’ll head back out to meet the permit returning to the flats on the incoming tide, and fish until dark. Accommodations are in basic but comfortable double occupancy cabañas on stilts, each with full tiled bath with hot and cold water and generated electricity. The clubhouse features the bar and dining room where guests enjoy libations and excellent meals featuring the freshest local seafood. Tarpon Caye Lodge is competitively priced and is currently offering a special for 7 nights/6-days fishing for $1,999 per person double occupancy. 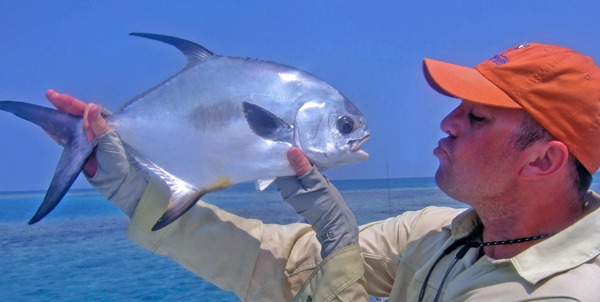 Permit Alley is a challenging fishery to be sure, but if stalking tailing permit on foot on gin-clear flats appeals to you, you owe it to yourself to take the challenge!